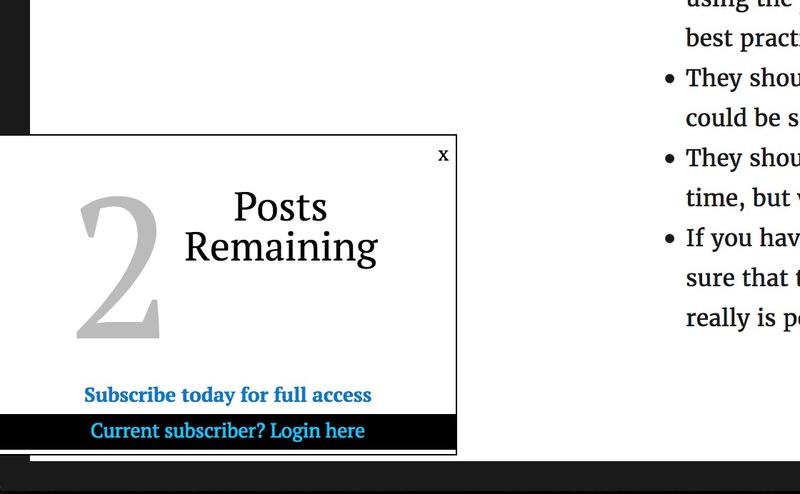 This add-on creates an Article Countdown Nag for the Leaky Paywall plugin. Lets the reader know how many free articles/posts they have left before they need to subscribe. Can be set to not show nag until a certain number of free articles/posts have been viewed. When a user views restricted content, a notice slides in from the bottom left of the screen after 3 seconds alerting them to how many free articles they have remaining. After a user has viewed all allowed content, they are present with a zero remaining popup with links to subscribe or login. In the settings, you can choose when to begin the display of the countdown nag.